Knee pain is a frequent source of disability and frustration for many individuals. Knee pain may arise from a variety of causes via overuse, athletic injury, auto immune disorders and wear and tear from degenerative arthritis. The knee joint is a simple yet complex joint, and the anatomy of the knee plays a fundamental and important role in the diagnosis of knee pain. 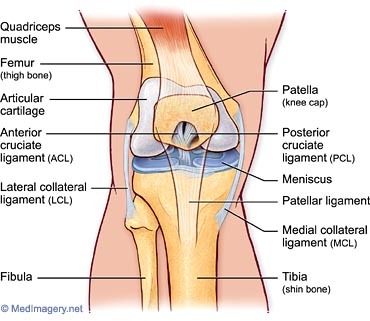 Major anatomical components of the knee are discussed below. Other components are discussed in relation to specific problems with the knee, listed further below. The kneecap or patella sits in front of the joint between the femur (thigh bone) and the tibia (shin bone). It is held in place by the quadriceps muscle and the patellar ligament, and moves or “tracks” as the joint articulates from contractions of the surrounding musculature. Pain here may be caused by abnormal tracking of the patella femoral compartment, often due to tightness or weakness of musculature or may be worn from excessive use causing anterior knee pain by the constant friction or rubbing against the adjacent long femur bone. The cartilage separating the femur and tibia bones is known as the meniscus. There are two meniscus, the medial (inside) and lateral (outside) meniscus, either may be worn due to normal everyday wear and tear throughout life or torn secondary due to trauma, such as an athletic injury. There are two ligaments that form crisscross attachments to the long femur bone and lower tibia bone. These are known as the anterior and posterior cruciate ligaments and they prevent backward and forward movement, and aid in stability of the knee. Injury to these ligaments may result in significant knee pain and functional difficulties due to the inherit instability of the knee when these ligaments are injured. Knee pain can arise from a variety of problems in the knee. Some of the more common knee problems or topics are listed below. To learn more about a specific topic, just click on the title. If you continue to suffer with chronic knee pain and your current treatment plan leaves you wanting more options, perhaps a fresh set of experienced eyes can change your outlook. Since 1990, Dennis M. Lox, M.D has applied his personal interests in sports medicine, cutting-edge regenerative medicine and chronic pain management to helping patients increase their quality of life. Contact us for an appointment at 727-462-5582.